These Christmas light safety tips will help you get in the holiday spirit and reduce your risk of fire or electric shock injuries. There's nothing like a twinkling strand of Christmas lights to really dress up a home, which is why many homeowners and renters hang them year after year. But because Christmas lights use so much electricity, that heightens the potential for an accident if you neglect to take certain safety measures. The last thing you want on your hands is an open fire—unless you're roasting chestnuts, of course. Below, an illuminating look at expert-approved tips on how to safely use, hang, and store Christmas lights. With every new box of lights, check for the mark of an independent testing organization like Underwriters Laboratories, which certifies and tests products for safety, recommends Susan McKelvey, communications manager for the National Fire Protection Association. Products certified by the Underwriters Laboratories will have the mark "UL." You should also do a quick search online to make sure your lights haven't been recalled. All Christmas lights are not made the same. When you buy Christmas lights to hang outside your home, don't just grab the same ones you'd use indoors. "Outdoor lights are designed to keep water from seeping into places and prevent the elements from causing a failure. Indoor lights aren't designed to do that," says McKelvey. Chad Ridenour, owner and CEO of Turn It On Electric company, says you must inspect your lights before decorating your home. Every year, he lays out all his lights in his driveway to ensure they’re in good working condition. Toss anything that’s frayed, broken, or warm to the touch. You’ll also want to plug in and turn on the light strands. If one bulb is not working or flickering after you put a new one in, it’s best to trash the strand since it could be a sign that something is wrong with the wiring. Likewise, ensure that your extension cords are in good working order. “When in doubt, throw it out,” says Ridenour. 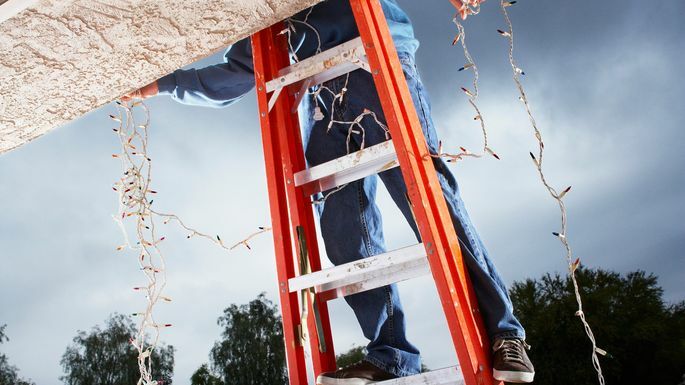 When hanging Christmas lights in hard-to-reach areas like the gutters on your house, make sure that the ladder you use is stable. Ladder falls can be fatal, so to protect yourself, make sure your ladder can hold your weight and is stable. Plugging too many lights into one outlet can overload it. "You don’t want to overload outlets because that can create a short,” says McKelvey. "Each outlet can handle a certain amount of amps to be drawn from it. If you overload an outlet, it can cause the outlet to fail." When this happens, an outlet generates heat and sparks, which can result in a fire. "We encourage people to not use more than one plug per outlet to ensure that they don't exceed the number of amps that the outlet is rated to handle," McKelvey says. If you like displaying a live tree in your home, be sure to purchase one that's as fresh as possible. A dry tree wrapped with Christmas lights will go up in flames much faster than a well-hydrated one. “A fresh tree is green and its needles are hard to pull from branches and don't break when bent between your fingers," says Karla Crosswhite, spokesperson for the Consumer Product Safety Commission. "The bottom of a fresh tree is sticky with resin, and when tapped on the ground, the tree should not lose many needles." Once you bring home your live tree, keep it well-hydrated with about 1 gallon of water a day. And if you favor an artificial tree, search for one that's labeled "fire-resistant." Taking down your Christmas decorations is never fun, but you'll want to be extra careful when packing up your lights. Storing your lights properly may extend their life span and will ensure they don't end up in a giant, tangled ball. “Untangling lights creates wear and tear on them. When you start yanking and pulling, that’s when they fray,” says Ridenour. Wrap the strand of lights around your arm, and gently place them in an air-tight box so they'll be ready to use next year.